Ratnamani has a dedicated facility for manufacturing Austenitic, Super Austenitic, Duplex and Super Duplex stainless steel welded pipes both from coil & plate. The weld procedures used are TIG, Combination of Plasma and TIG , TIG with filler, K-TIG, TIG and SAW , SAW depending up on the wall thickness of input raw material for Pipe manufacturing. 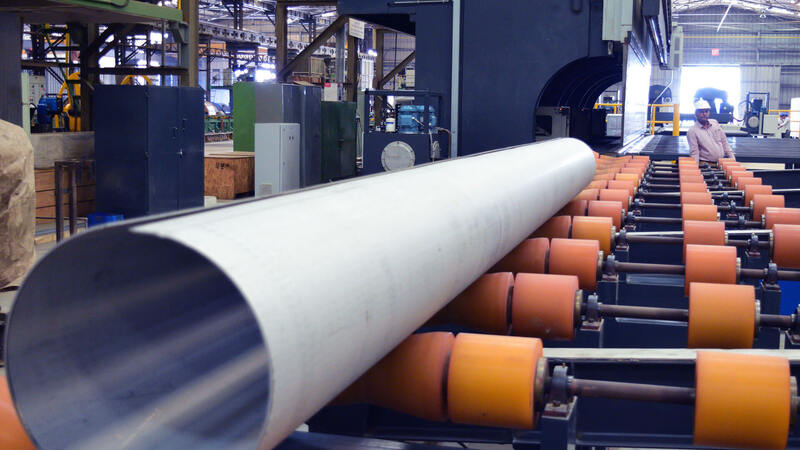 Stainless Steel Welded Pipe upto 12 NPS in double random length are manufactured using coils. The welding process is controlled by laser seam tracking equipment to optimize the quality of weld seam. Ratnamani is also having facility for the production of pipes from single stainless steel plate, on JCO Press upto 48 NPS. These pipes can be produced in single random length or double random lengths with Single Long Seam. Stainless Steel Welded Pipes above 48 NPS & upto 72 NPS can be manufactured with a combination of longitudinal / circumferential joints. A complete range of testing facility in-house contributes to consistent quality control. With good investment in modern forming & welding techniques, Ratnamani is able to meet the most stringent market demands in terms of quality and delivery. Eddy Current, Ultrasonic, Dye Penetrant, Hydro etc. Pipes are supplied with Plain / Bevelled ends.